Toyohara Kunichika (1835-1900) Musical Beauties: Drum Player, 1878. Oban. Another exceptional series from 1878 features women performing classical music compared to songbirds, featured in the fan shaped cartouche above them. 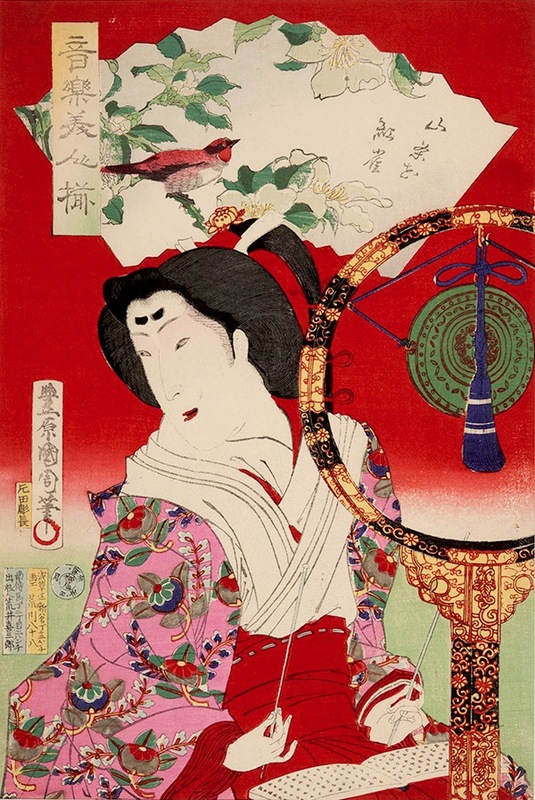 Typical of Kunichika’s prints of the time, the backgrounds are rendered in bright reds and greens, a modern use of imported aniline dyes. These colours were understood to be the colours of progress and represented the new era of enlightenment. The red background in this picture is sometimes referred to as Meiji Red and pictures of this colour termed 'Meiji Red Pictures'. This print depicts a female drum or gong player in traditional costume compared to a songbird on a tree branch in the cartouche. The print is unevenly trimmed to three sides, otherwise it is a fine early impression with strong colour, embossing to the collar and shading to the red and green of the background. The series is illustrated on page 62 of Amy Reigle Newland, Time Past and Time Present, Images of a Forgotten Master, Hotei Publishing 1999.